First Aid kit is a necessity in every household. I am sure every one will agree with me on that. However, not only at home but also in school, in your car or at the office. This kit should be within reach to provide instant care in emergency situations. It is also very convenient to have a first aid kit in hand so you do not have to rush yourself in pharmacy to buy bandages when you get minor injury or when you suddenly feel like somebody is tightening a giant vise around your head and you need a medication. My first aid kit at home gives such a big convenience most especially when cluster headache visited, I got myself a stock of med. My son suddenly had a fever, I got a medication and fever gel. Hubby cut himself while chopping the veggies, I have a ready bandage, gauze pad and betadine. Emergency do happens that is why it is always best to have emergency kit handy. There are first aid kits you can buy in any drugstores or you can design your own first aid kit according to meet your household's needs. In my own opinion, I think it is more practical to costumize it yourself and you put the brand what you and your family commonly used. Keep the manuals for future purposes. It shows how to use some of the supplies. Always check for the expiration dates of your supplies. What I do is I replace my first aid kit yearly just to make sure everything is safe to use. Keep out of reach of kids. They might play with the supplies and worse things might happen. But if your kids are big enough I guess it is also best to educate them about how to use it. Because sometimes they respond calmly in emergency situations. Just like when his younger brother bumped his head on the floor when he rolled over, I panicked and picked my baby tried to calm him from crying. While my eldest took the cold compress filled with ice and gave to me. No bleeding, and it is already late when I realized that my baby was not upset at all because it was just a minor bump and it was just me who freaked out. I confess, I am a panic baby. It is good to know that my eldest applied what he learned from me in the event that any emergency situation occurs. He familiarized himself on how to clean his own wounds as well. Sine he always get wounds for being very hyperactive when with friends running in school or in the backyard. I also have a small first aid kit which I always bring with me when we travel. 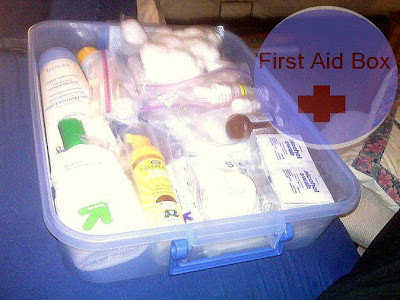 Do you also have your own first aid supplies ready at home? Having first aid kit at home is really important in case of emergency. Your first aid kit looks great! I love how you remembered a flash light. My family and I always stock up on them in case of emergency...right when the power goes out. It seems like we can never remember them beforehand. I also like to keep a lot of tegaderm wound dressing on hand. I prefer them to band aids or tape and gauze. They stay in place even after lots of wear and tear. Nice! I also have my first aid kit at home pero maliit lang siya. Might do this as well. saving your list :D thanks for sharing sis!